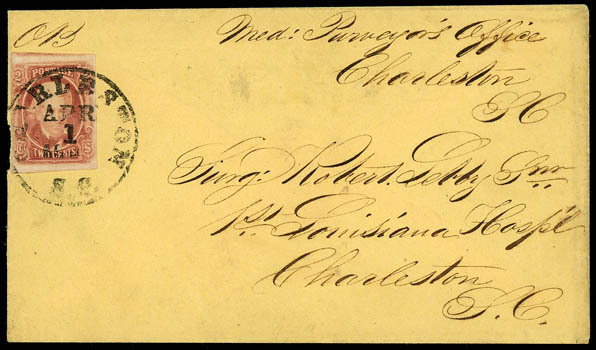 Confederacy, 1863, 2¢ brown red, large to huge margins except left margin barely nicked, tied by bold "Charleston, S.C., Apr. 1, 186-" cds on yellow cover, address in attractive script to surgeon at 1st Louisiana Hospital in Charleston S.C., with matching endorsement "Med: Purveyor's Office, Charleston S.C. O.B. ", note on back flap regarding necessity of addressee returning medical supplies, Very Fine, a scarce drop rate usage, ex-Kohn. Scott No. 8 Estimate $750 - 1,000. Dr. Robert Lebby, Sr. was assistant surgeon at Fort Johnson in Charleston Harbor. At the outbreak of the war, Robert sent his wife Elizabeth and their 11 children to Sumter to ride out the war. Dr. Lebby served as a surgeon for the Confederate army and returned safely to his wife at the war's end. They had four sons to also served the Confederacy. Captain Henry Starling Lebby, CSN was a masterful blockade-runner operating between Charleston and Liverpool, England. An article in the New York Times, February 15, 1862, noted Captain Lebby's ship, "there have been several arrivals of small craft from Secessia with turpentine and cotton - one was the notorious privateer schooner Sallie. She is about the hardest looking vessel for a privateer I have ever seen." Through the war, Captain Lebby was never captured. Two other sons, Robert, Jr, and Monroe, both physicians, served faithfully as surgeons in the Confederate army. John Walker Lebby, following in the footsteps of his older brother, served as an engineer abroad the blockade-runner Nina, but was lost at sea in 1865. Dr. Robert Lebby, Sr. and Jr. had long careers in public service as chief surgeon for the quarantine station at Fort Johnson and serving the people of James Island. Dr. Lebby, Sr. in his life served as army surgeon for 20 years, city Alderman, City Registrar, Port Physician, State Health Officer and Surgeon General for South Carolina. 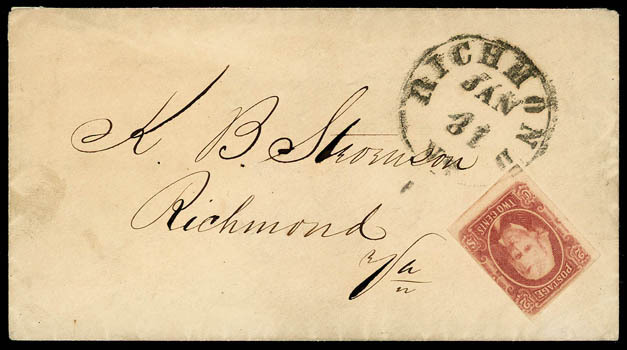 Confederacy, 1863, 2¢ brown red, margins large to slightly in at right, rich color, tied by "Richmond, Va., Jan 31" cds in margin leaving stamp uncanceled, on local drop cover, Very Fine and choice; signed Dietz on reverse. 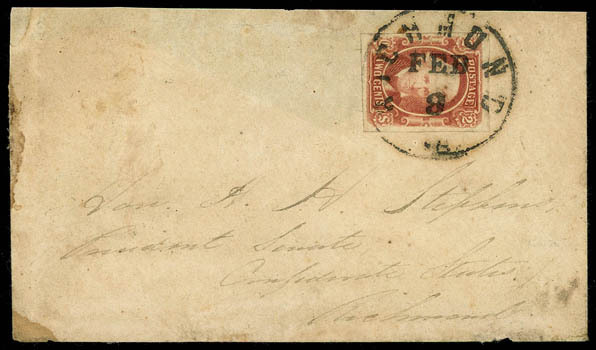 Confederacy, 1863, 2¢ brown red, large margins to just in at left, tied by indistinct town cancel on small adversity wrapper to Jasper, Texas made from an estate account, manuscript "One paper" notation at upper left, F.-V.F., a very rare wrapper usage. Scott No. 8 Estimate $400 - 600. 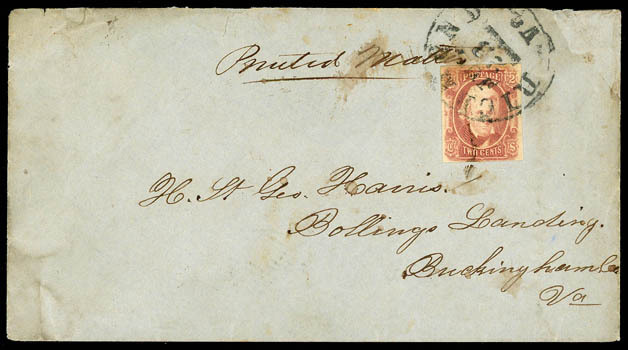 Confederacy, 1863, 2¢ brown red, margins ample to clear at bottom, tied by "Richmond, Va., Jul 23" cds and light ink smudge on cover to Bollings Landing, Va., manuscript "Printed Matter" endorsement at top; partial backflap, F.-V.F., a scarce printed matter rate cover; signed Dietz. Confederacy, 1863, 2¢ brown red, four margins, rich color tied by "Richmond Va. Feb 9" cds on drop letter addressed to Alexander H. Stephens, President Senate, Confederate States, Richmond; no flap as usual, small corner mend and flaws, Fine and rare drop letter use to Vice President Stephens. 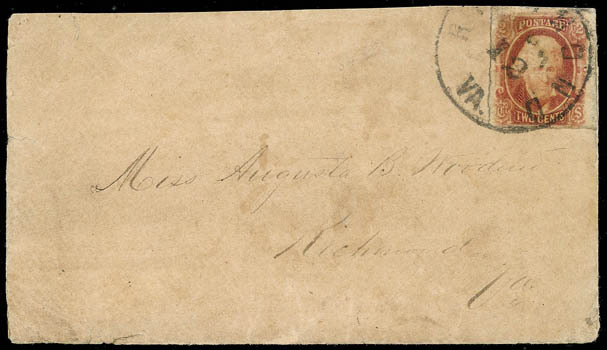 Confederacy, 1863, 2¢ brown red, margins large to just touching, tied by Richmond, Va. cds on locally addressed drop letter to Miss Augusta Woodward; cover and stamp flaws, no flap, Fine appearance.